The Capsicum has a long cultural tradition in Mexico. Known locally as the "chile", some archeologists consider it as one of the first plants cultivated in America. At least one of its species, Capsicum annum, was planted in this area during the pre-hispanic times and was an important source of nourishment and tribute during the European conquest. Today, the chile is an important part of the Mexican's diet on all social levels; it may therefore be considered as a common denominator between classes. The sum of all the common cultural traces between social classes is what forms the basis of a country's nationality. 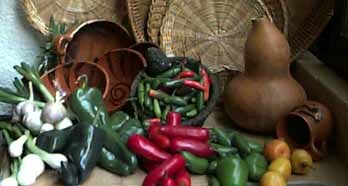 The chile is one of the attributes that identify the Mexican culture. This spice has contributed with taste and variety to Mexico's basic diet during the last 8,000 years; we might even ask ourselves if this diet based on corn, beans and zucchini would have lasted so long without the use of the chile. The chile has the virtue of pleasing four senses: sight, with its bright shades of green, yellow, red, orange and black; taste, since it may be hot, moderate or sweet, smell, with its strong smell, touch, since handling some species without gloves produces stinging in the skin. The Capsicum is characterized by its hot flavor. The hotness is determined by the amount of capsicine (C18H27NO3) in the fruit, where it is more concentrated in the placenta. The capsicine is controlled by a dominant gene; those which are missing this gene are the sweet peppers. The degree of acridness changes depending on the type of chile and the amount of placenta with respect to its walls. Therefore small chiles are generally hotter that larger ones. Nowadays it is possible to control the amount of capsicine by selection methods. MexAssist is your personal assistant when doing business in or with Mexico. You may find Mexican legal, financial or real estate information indispensable for investing successfully in Mexico. We also have an experienced staff of translators to help you with any translation you might need. Copyright 1995 MexAssist S.A. de C.V.